There are a lot of pencils out there, and it seems there are even more cheap pencils (that isn’t possible, I realize, but it made sense when I was typing it). How good can some of these pencils be? Today I’ll be taking a look at the Paper:mate Mirado Black Warrior Pencil. The pencil body is simple and round, which is surprisingly not a standard pencil shape. I always had round pencils at school (a set of leftovers from my father), and people always liked the way they felt when I loaned them out (which is why I lost so many). 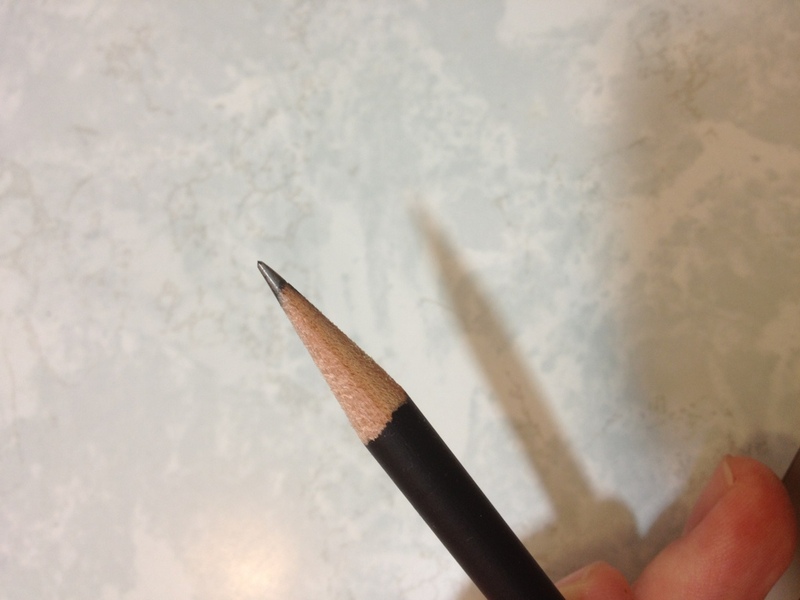 The shape is quite comfortable, and just that little bit better than a hexagonal pencil. The set of pencils that I received have a satiny finish that make them fairly grippy even with sweaty hands (from what I understand, they used to be more shiny and slippery). The rest of the body is a plain black with “Mirado Black Warrior” in gold on it in a poorly chosen font, as well as HB 2 and the Papermate logo, the hearts of which take away from the “warrior”-ness. The back of the pencil has a standard pink eraser, which does its job and hasn’t dried out in the time I’ve had it. I’d guess it isn’t the best quality and if you always want to erase what you wrote I’d recommend getting a dedicated eraser, but these work fine for most of us. The lead is HB, but feels much softer than most HBs I’ve used. Perhaps that is just me, but I’d say it is at least a little softer and it covers smoothly and well. A good pencil for filling in scantrons or shadows. Because it is so soft it is not too great at holding a point, though. Is it a good pencil? Definitely, and for the money it’s really just a matter of preference. There are loads of good pencils in this price range, so if one that is round (make sure your desk isn’t slanted) and has a slightly softer lead sounds good to you; or maybe you just like the “stealth” idea of an all-black pencil, this one is at least worth looking at. And like I said, for the price almost anyone could afford to pick up a box to compare to any other pencil they happen to be using. This entry was posted in Beginner Supplies, Utensils and tagged art supply, art supply review, mirado, mirado black warrior, papermate, papermate mirado black warrior, papermate mirado black warrior pencil, papermate pencil, pencil, review by Dragon Co (Austin Smith). Bookmark the permalink.